How to (Block, Build,) Be. I like to stay up with the news, for the most part. But, sometimes I get overwhelmed. Recently, several young adults told me that they don't plan to have kids because the world is such a mess. Millions of refugees are fleeing violence and instability, there is an increase in the polarization of political views, police violence is escalating against people of color, economic inequality is on the rise, wars are happening all over the globe, not to mention climate change. We don't know what is happening to our bodies as more and more of us, myself included, have autoimmune diseases; and some types of cancers are on the rise. There is a lot for all of us to worry about. How can we keep from falling into despair or giving up? The paradigm that has been most helpful for me in transforming my feelings of overwhelm and insufficiency is one I learned from the Buddhist Peace Fellowship (BPF) at a gathering last summer. It's Block, Build, Be, and it's based on Joanna Macy's three pillars of the Great Turning. Applying Block, Build Be to my life lifts me out of despair and into action. It goes a long way to reducing my stress and allowing me to sleep at night. Blocking means we are not just refraining from causing harm, but we are out there stopping others from causing harm, too. 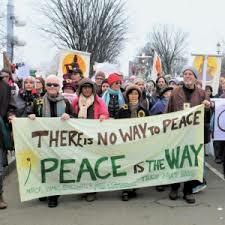 It may include going to a rally, sharing the work we are passionate about with other people, or resisting the tendency to go along with meannesses for the sake of “keeping the peace.” Blocking harmful actions benefits the one being harmed, and, if you believe in karma or that you "reap what you sow," then in the long run, Blocking also benefits the one poised to do the harming. But Blocking is just 1/3 of this practice. Build is a commitment to creating the world we want to live in. adrienne maree brown writes beautifully about this in her book, Emergent Strategy. 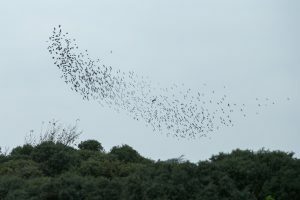 My dream is a movement with such deep trust that we move as a murmuration, the way groups of starlings billow, dive, spin, dance collectively through the air -- to avoid predators, and, it also seems, to pass time in the most beautiful way possible... here's how it works in a murmuration/shoal/swarm: each creature is tuned in to its neighbors, the creatures right around it in the formation... there is a deep trust in this: to lift because the birds around you are lifting, to live based on your collective real-time adaptations. In this way thousands of birds or fish or bees can move together, each empowered with basic rules and a vision to live. Imagine our movements cultivating this type of trust and depth with each other, having strategic flocking in our playbooks. My personal practice of Building is learning to relate to other people in the way brown describes. To connect more deeply with those in my immediate vicinity, to "love the one you're with", as Crosby Stills, and Nash sang to me over and over again in my youth. And from that love, build real community. And, for me, this is a harder task than it would seem. My habit and conditioning tug at me, telling me to stay at what seems the safer surface of relationships. I fear taking risks with people I don’t know well. Resisting these inner voices, I try to get to know my neighbors better, invite friends over for tea and talk about what's happening in the world and what matters. I take the time to ask people what they think and feel. This is my growing edge. The final 1/3 of the practice is Be. Being may be the most challenging three elements. Being present and awake in times of suffering is difficult. Some part of me wants to spend every day in bed watching stand-up comedy on Netflix, chuck my phone, and drown myself in the chocolate fondant from the local bistro. And now and then, I need to do just that. 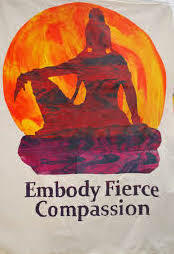 Thich Nhat Hanh taught something important about Being -- to Be is to Inter-Be. I can never be on my own, because my happiness depends on your happiness and your happiness depends on my happiness. Being is not a solo practice. If I fall into despair, I contribute to more suffering for you and everyone else. And if I help you, I am helping myself. So Being means I am open and engaged. It means I accept support from my meditation community, my teachers, and the authors and leaders I trust to help me Be a more fiercely compassionate person. And I pass that support on to others, too. Being is also about knowing what harmful seeds I am carrying inside of me and how to transform them. My conditioning has created ticking bombs inside of me that could go off at any moment, harming a lot of people. In order to be someone who is contributing to healing means I need to heal myself first. I need to learn about the internalized biases lying dormant in my mind's store consciousness, ready to say and do violent and discriminatory things, and replace them with what I know to be true. (see Clearing the Weeds of Racism, Sexism, Homophobia, Transphobia, Ableism, and Economic Injustice). By doing this inner work, I can Be someone who rarely causes harm unknowingly. I can Be a refuge for myself and other people and have the freshness I need to keep Blocking and Building. The three aspects of this practice -– Block, Build, and Be –- inter-are with each other. Doing one is not enough. Sometimes we think that if we can simply Be a nice person or we if just Block all bad actions or Build something new, each in itself would be enough. This model suggests, and I would agree, we need all three. Block, Build, Be is a structure, an approach to each and every day. It's not another way to measure of our morality in order to find ourselves lacking, and it's not a goal. It's a shorthand reminder to put one foot in front of the other and do what we can do today for this messy, scary, and beautiful world.